The long awaited US release of Kinji Fukusaku's Battle Royale could not have come at a better time. With the hugely anticipated release of The Hunger Games, the first in a trilogy based on the young adult novels by Suzanne Collins, coming up this Friday, Battle Royale's arrival on US shores is perfectly timed. It is, in many ways, the original Hunger Games, although most Americans have probably never heard of it, let alone The Hunger Games' legions of young fans. After all, Battle Royale was restricted even from the young audiences of Japan, which has a notoriously lenient rating system, and the film wears its R-15 like a badge of honor, constantly reminding us as the film is starting that if you are under 15 - get out. It's all a bunch of marketing bluster of course, the film clearly wants to be seen as the epitome of cinematic carnage. And while it is certainly violent, there have been plenty of rougher films that have come out since. Image courtesy of DVD Beaver. What makes Battle Royale so different and sets it apart from the genre film pack is that its violence involves children. Fans of The Hunger Games will find its plot eerily similar, although Collins claims to have never heard of the film until after she had written the book. Which is a believable story, given that Battle Royale, which was released in Japan in 2000, has never officially made it to the US outside of film festivals and bootleg copies until now. Set in Japan, the film takes place at a time when unemployment and rampant youth angst have nearly ruined the country. Employment as skyrocketed and delinquency is out of control. So the Japanese government passes a law requiring one 9th grade class a year to participate in a "battle royale," where the entire class is taken to a remote island and forced to kill each other off with various weapons until only one victor remains. Children die left and right while a select few try desperately to cling to their humanity. But while some refuse to kill, others embrace their new Darwinian challenge wholeheartedly, and soon no one is to be trusted. Two lovers take center stage in this epic bloodbath, and form a tentative and unlikely alliance with a deadly exchange student. As they and several other students try to subvert the system and beat the game on their own terms, others embrace it as a kill or be killed free for all from which they refuse to be eliminated. In a world where only one can survive, even your best friend becomes a potential target, or a potential threat. Yes, it's remarkably similar to The Hunger Games. It basically is The Hunger Games, albeit with a much a much darker vision. It's true that The Hunger Games is surprisingly dark for a book aimed at younger audiences, but Battle Royale is downright twisted, and fantastically so. Not only is it gruesome and shocking, it's also disarmingly funny. Fukusaku balances gut wrenching action, emotional pathos, and a pitch black sense of absurdity. It's both deliciously over the top and yet deeply personal. It draws us into the world of these children and makes us care about their struggles, even the villains that pose a threat to our heroes. It's certainly a strange beast, but it works, and it works very well. It's not a face value film, it leaves its audience questioning, reflecting, and debating its hauntingly resonant implications. It's blu-ray release by Anchor Bay is certainly something to be celebrated, despite its complete lack of special features (a box set that includes Battle Royale 2 is also available, and contains an extra disc of features). Long unavailable to general audiences in the US, the film now has the chance to expand its audience to fans who may have otherwise overlooked it. Of course, some Hunger Games fans will likely accuse it of ripping off their beloved franchise, while hipsters will doubtlessly taut their foreknowledge of the film, and that Battle Royale did it first and better. The fact is, Battle Royale deserves to be considered apart from The Hunger Games, because as similar as they are, they are both different animals with different fanbases, although fans of one should certainly explore the other, as both certainly have their merits. Now, thanks to this new blu-ray release, everyone will have the chance to judge for themselves. 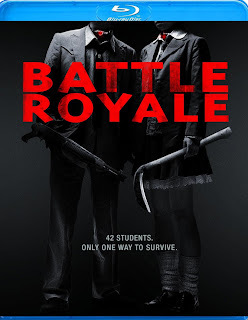 BATTLE ROYALE | Directed by Kinji Fukusaku | Stars Tatsuya Fujiwara, Aki Maeda, Tarô Yamamoto, Takeshi Kitano, Chiaki Kuriyama | Not rated | Out today, 3/20, on Blu-ray and DVD.